After spending 20 years in the mountains of Scotland and elsewhere, Steven decided share his outdoor passion and began leading groups into his beloved hills. Our business was set up in 2007, and now, with a team of friendly freelance guides and instructors, we can take you on weekend hillwalks, technical mountain scrambles, navigation courses, and all-inclusive packages to beautiful remote corners of the country. The people you see here all hold as a minimum the Mountain Leader Qualification and all are registered with the relevant Mountain Training Associations schemes. All are qualified to lead in summer and winter. In addition to mountain leading, some of our freelance team also have their Single Pitch Award, International Mountain Leader, Trail Bike Leader and Mountain Instructor Award qualifications. All of our team hold appropriate insurance to cover the activity they are leading and are freelance, some with their own business working here in the UK or abroad. Steven has been hill-walking for over 20 years in Scotland and elsewhere in the UK and Europe. In 2003 he 'compleated' his 11th Munro round (all the peaks in Scotland over 3,000ft - there are currently 282), therefore taking the record for the most rounds. In 2012 this passion for the peaks had seen him tick off 15 Munro rounds and in 2013 he finally got around to compleating his Corbetts (hills in Scotland 2500-3000ft). In 2006 he took up hill-racing, competing with others who love the challenge of running the hills. This led not only to winning several races and mountain marathons outright, but also to writing the Pocket Mountain's guide book "Classic Hill Runs and Races in Scotland". 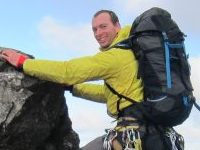 In 2007 Steven gained the Summer Mountain Leader qualification and has since been sharing his enthusiasm, guiding people up the Scottish Mountains to stunning scenery. His Winter Mountain Leader followed in early 2013 - who knows what is next ! Dislikes : Pollution, cooked mushrooms, punctures ! 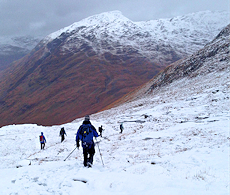 Richard has been hillwalking and exploring wild places in the Scottish Highlands for over 20 years. It was an interest in mountains and the natural world that lead him to study Geology and Physical Geography before becoming a hillwalking guide. Qualified to Winter and International Mountain Leader standard, Richard is now working towards his Mountain Bike Leader qualifications. Most of his time is spent outdoors and loves taking people on adventures whether its a multi-day journey through wild mountains or an easier walk looking for wildlife. Richard also works with youth groups and has lead expeditions in the UK, Africa, South America and India, but his favourite place is the Northwest Highlands of Scotland or everything west of the Moine Thrust! He is often found relaxing in wild and beautiful places with a book. 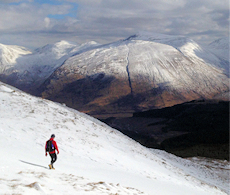 Al Ewen has been exploring the mountains and wild places of Scotland for 25 years. Having grown up in Shetland and Orkney he's a keen fan of Scottish islands and northern parts of Scandinavia like Sweden, Norway, Iceland and Svalbard where he first began working as a mountain leader in 1993. Al is a qualified as a Mountain Leader to Summer, Winter and International standard. Al is also a hill runner competing in races across Scotland, his favourite race being the Ben Venue Hill Race which takes place in October. After many years touring through mountainous regions on his motorbike, John thought it would be even better to get among them, so he and his wife Tracey bought walking boots in Chamonix 20 years ago, and was immediately hooked. The intervening years has seen a round-and-a-half of the Munros, the achievement of the Summer and Winter Mountain Leader Awards, walking and climbing trips all over the UK, the Alps, Pyrenees, Dolomites, Sierra Nevada, Carpathians and Africa. 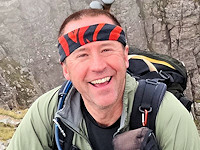 John is particularly passionate about the Scottish mountains, and enjoys taking people to new places and helping them to share the experiences that fire him. When not in the hills, he enjoys cycling, motorcycling and the odd dram ! Emma was introduced to hill-walking at the age of 8 by her father and was teaching him how to navigate by the time she was 12! She grew up exploring the Lake District and Snowdonia before moving to Scotland 20 years ago where her Munro career began. She completed her first round of the Munros in 2004, and regularly returns to her favourite mountain areas. Emma enjoys single and multi-day adventures and is at her happiest when in the outdoors, frequently accompanied by her 7 year old collie cross, Moss. Emma studied Geology at the University of Edinburgh and is currently working towards an MSc in Environmental Management. She holds the Summer and Winter Mountain Leader Awards and is a qualified Wilderness Emergency Medical Technician. In her spare time she volunteers as a member of Tayside Mountain Rescue Team and is a key member of the 'hasty' team which responds quickly to call outs, she is trained in all aspects of search and rescue. Her next ambition is to work towards becoming an International Mountain Leader after numerous independent trips to the Alps, Pyrenees, Andes and Himalayas, a highlight of which included a solo venture across the Haute Route of the Pyrenees in 2012. Emma is also learning to ski and when not busy outdoors can be found relaxing by the fire with a good book. Ken has spent more than 10 years climbing, trekking and ski touring throughout the UK, Europe and further afield. He's as happy bouldering on the sandstone boulders of Fontainbleau, France as he is climbing a committing and technical route in the Alps or guiding a classic ice climb on the North Face of Ben Nevis. As an independent team, Ken and his partner, Hannah summited the majestic AmaDablam 6,856m, in Nepal in Nov 2014. Ken holds the Mountaineering Instructor Certificate and the International Mountain Leader and lives in Fort William with Hannah. They also spend part of the year guiding in the Spanish Pyrenees. Ken leads our Skye Cuillin Munros events which take place in May and September. David moved up to scotland about 10 years ago after studying geography at Portsmouth. 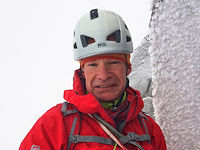 Now a qualified winter mountain leader and with the mountain instructor award, he has spent his time, climbing, scrambing, walking and running around the mountains of Scotland ever since. David has a keen interest in the geology and botany of the Highlands and is keen to learn new plants and get stuck into the rock. David has climbed and walked in France, Spain, Turkey, Indonesia, Tanzania and Ladakh including Mt Kimanjaro, Mt Blanc and Stok Kangri. He considers the mountains his natural habitat ! Likes : Andy and his shadow are Gemini and because he likes food he often eats for two ! Andy's father was an Alpine photographer in the 1950's and an uncle was an Multi-Activity Instructor in North Wales. At school two superb teachers nurtured his love of outdoor pursuits by taking small groups onto Dartmoor in late winter, living under (real) canvas whilst climbing and walking (without adults) across the bleak moors. The legacy of his early years continues. Andy's early steps in the Outdoor industry were on Drake's Island last Century where he learnt his trade through some eye-watering experiences. For the past 25 years he's been a teacher of English in Scotland and freelance MIC. He's a former Training Officer in Mountain Rescue Scotland (currently, he just tries to do as he's told): he has climbed throughout the Western Alps & now enjoys working with Steven and other similarly excellent companies in the World's most beautiful classroom: our great outdoors. With a decade of regular hill-going behind him, Kevin has completed two rounds of the Munros and is on his third. Among these, he completed a 98-day round in the summer of 2013, the subject of which became a one-hour documentary for BBC Alba; Dhà-Ochd-Dhà (Two-Eight-Two). He has a particular fondness for multi-day mountain trips. He enjoys the bothies, camping (sometimes on the summits), the 'bivvys' (in retrospect! 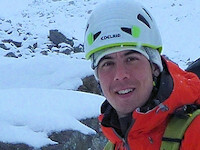 ), and also rock and winter climbing, all of which which he records on his blog. Kevin holds the Mountain Leader Award and enjoys sharing the mountains with others. If not on the hills, he will often be found film making or playing music. Growing up in and around Glasgow, John first developed his love of the outdoors at an early age in the Southern Highlands. 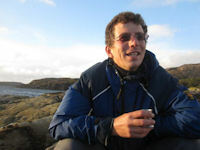 Since then he has taken every opportunity to get out into the hills, exploring many of the wilder and more remote corners of the Highlands, in all seasons, and has built up an intimate knowledge of the Scottish hills and glens as well as a keen interest in the ecology, geology and history of the natural environment. 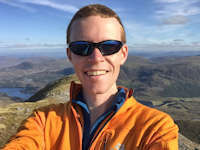 He completed the Munros in 2013 (and is currently well on his way to a second round), has visited many Corbetts and Grahams, and in recent years has also explored many of the UK's other significant peaks. John also enjoys getting his hands on rock and has completed many of the UK's classic scrambles and is a keen rock climber. John is passionate about passing on his knowledge and skills, and sharing his enthusiasm for the hills with others. This led him to qualify as a Summer ML in May 2014. Since then he has gained the SPA award and completed his Winter ML Assessment in January 2018. Dislikes : Not being able to get out on the mountains ! As a qualified Level 3 Mountain Bike Leader and Summer Mountain Leader, David has more years of experience in the mountains and on a Mountain Bike than he is prepared to admit. He claims that he is not competitive, but has completed in many fell and hill races and managed an age-group win at the gruelling 40 mile Tour de Ben Nevis Mountain Bike endurance race in 2017. 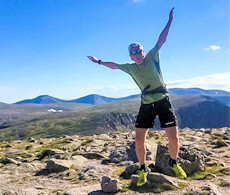 Having completed the Munros in 2000, David applied his love of running in the hills to complete the challenging Bob Graham Round on his first attempt taking 21 hours. This is a 72 mile route over 42 Lakeland summits within 24 hours - phew! Likes : Airy mountain ridges, mountain flowers and a good scone. Christine grew up walking in the Lake District hills and then discovered Scotland! She enjoyed several decades of being a successful, competitive mountain runner and now, after 40 plus years of enjoying the hills of Scotland and elsewhere both running and walking, wants to share her passion and knowledge with others. Having trekked extensively in Peru, Bolivia, Nepal, Corsica and the Pyrenees, she loves 'stravaiging'! Christine is a qualified Mountain Leader (Summer) and is currently working towards her Winter qualification. Christine also sails on the West Coast of Scotland, but when not away in wild places of sea and summit, loves gardening both at home and in her local village of Old Kilpatrick. Likes : Combining perfect conditions in the hills - with being there! Going light! Will has been involved in adventures through work and play for all his working life (35 years - gulp!). Coming from the south provided the opportunity to go north or south in order to climb and ski in the Alps as well as extensively in the UK. 17 years in the Army helped developed the passion further as did running outdoor centres for the military in both North Wales and Glencoe. Will is at home walking, running, biking, skiing and climbing in the Highlands and further afield; there is obviously too much to do. Will has travelled; climbed / trekked / skied extensively in places including North and South America, Africa, Nepal, Norway, the Alps and South Georgia (the one in the south!). Add to that a passion for Ironman triathlon and hill running life is busy! Will holds the Mountain Instructor's Certificate, is an International Mountain Leader, a Mountain Bike Leader, Nordic Ski Instructor and First Aid Trainer.